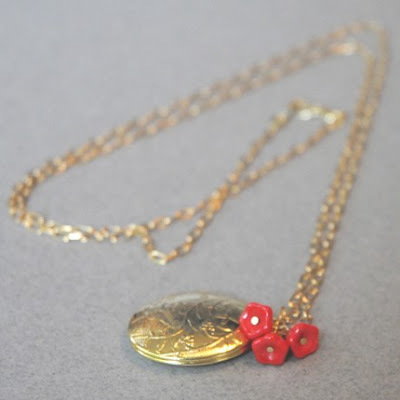 avec la fleur: giveaway from suzannemade! Thanks for the heads up on a great shop. I am IN LOVE with the Camera necklace. But the pinecone necklace takes a close second. These are beautiful pieces! I would choose the necklace with the scissors. Very cute shop! i'm not gonna lie--i checked and would still prefer the gold locket above anything! so adorable. Okay, so I have a top 3. My first choice would be the sweet songbird (I love the quote on the back! ), my second would be the gold locket (I've never had a locket before and always wanted one), and third would be the antique key and pearl...so there is a fourth, the cherry blossom necklace too! Seriously - just one thing?? I started browsing and thinking 'Christmas' and I think I found something for all the ladies on my list! I would buy for me the Sweet Songbird Necklace or maybe the Imagine Necklace. For my mom (also named Suzanne!) I would order the Paris Je t'aime Charm Necklace or Sew Lovely Necklace. My sister would totally love the Blossom Necklace. Oh so many choices! What a great give away! Posted the giveaway on my twitter (http://twitter.com/abjacob) and on facebook! She has sooo many cute things in her shop! I would love to have any of her necklaces, especially the camera necklace and the key & pearl necklace. The Paris Je'Taime necklace is also very cute. They would make lovely christmas gifts! i would put it towards the sweet songbird necklace because i love anything with whimsical birds. I would definitely get the Cute Camera necklace...lovely giveaway! her stuff is so sweet! I love the camera necklace! i blogged about this (: anything to help my chances, haha. lovely! i am torn between the blue teardrop gold necklace and the santorini necklace. great giveaway - thanks! oh please enter me! that camera is a perfect christmas present for someone on my list! The "Sew Lovely" necklace is... well, so lovely. :] I think if I were to win, the money would definitely go to buying that. If I won (and maybe even if I don't!) I'd get the "Sam the Squirrel" necklace as a gift for my little sister. We have an ongoing joke that she resembles a squirrel and every Christmas for the past 4 years I've gotten her squirrel themed gifts. Perfection! Oooh. I would have a hard time choosing between the squirrel and the key. I guess I would have to get both! If I won the gift certificate, I would probably buy the emerald globe earrings. They're sweet! The Gold locket is my favorite. I hardly have any necklaces and I LOVE lockets!! Plus the little flowers is an added bonus!! i love these! i would for sure pick the sweet songbird necklace! 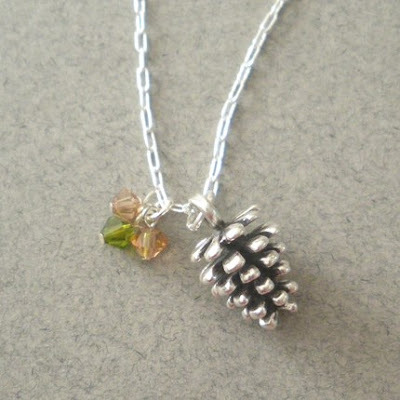 I love the pinecone necklace, but there are so many great choices! I'm in love with the sweet song necklace! Wow, way cute! 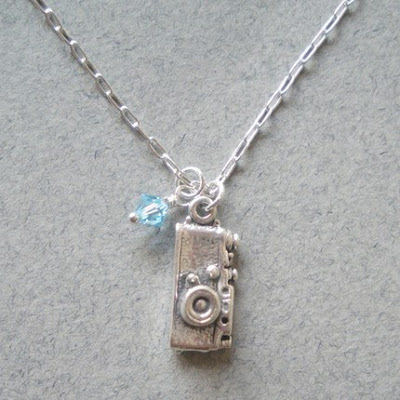 I love taking photographs like I love eating cookie dough, so I would choose the camera necklace fer suure! im gunna have to say the camera necklace!! oh i love that antique key & pearl necklace! but her paintings and hello, goodbye stationary are so cute too! There are so many cute choices! amazing giveaway! I looove the camera necklace! I would DEF use it to go towards the antique key necklace... I Love it!!! There's so many good choices! I really like the sunshine on a cloud day necklace - it's different than anything I own! Oh darling! :-) I would love to enter.. I love the "Purple Blues" necklace. So pretty! as a photographer i thought i was instantly attached to the camera charm, but after perusing the suzannemade etsy shop, i've fallen in love with the mini sewing machine necklace because it reminds me of my mother. great giveaway! Very cute shop! I like the Sew Lovely necklace. I have an ancient Singer sewing machine that my grandmother gave me that I sew on. It's a beast but it rocks! i'm with you - the golden locket is my favorite!!! it is so cute! i would love to have the blue teardrop and gold necklace! it's so simple and beautiful! and that cute camera one! i LOVE the antique key and pearl necklace!!! I would buy the darling sewing machine necklace. Or maybe the Sunshine on a Cloudy Day one, to brighten things up! I love the antique key and pearl - its gorgeous! sunshine on a cloudy day is fabulous or i'd get the santorini for my sister... love love love the shop... your taste really is exquisite! here's the blog i wrote about your giveaway~ thanks again for sharing! http://rooftops-rapture.blogspot.com/2009/11/experimental-giveaway.html happy tuesday! I honestly couldn't choose just one. I tried but they are all so lovely, maybe that means I can't win but if I do I guess I would have to really focus on what I wanted. I have been looking for some new necklaces these would be just perfect. Oh, I love the tiny acorn necklace... and the beautiful gold locket you featured. I don't know how I would decide!! I would buy the tiny acorn necklace! I'm such a little squirrel at heart! Im a huge sucker for lockets so my favorite is probably the gold locket but I also really love the imagine unicorn necklace and the pinecone one. I'd so use it toward the camera necklace. I'm looking forward to reading more about your efforts to reduce poverty. Back for the 2nd time--I tweeted about this through my Angela2932 twitter account. ooh...love this new store! thanks for bringing it to my attention! i really like the leafy green charm necklace and the antique key and pearl necklace. i can't decide between the gold locket or the cherry blossom necklaces. i love the gold locket because i can hold someone close to my heart. i love the cherry blossom necklace for it's beautiful and creative design. great pieces! I'd have to pick the golden turquoise bracelet. It would definitely flatter my outfits. I love the Imagine one. So simple. i love the leafy green and cherry pop necklace! Oh my goodness, I love that locket! So beautiful. Thanks Jasmine! I love the camera one! Or the locket! They are beautiful! All her stuff is really beautiful - the locket is gorgeous. Thanks AEIP! Hi, Jasmine! I love her Etsy shop. She makes some really sweet pieces. I would use the $20 towards the "I believe in Unicorns" piece. About a year ago, a good friend of mine in San Diego organized a mass donation from friends of mine, whom she'd never met, all over the country to send me $350 dollars to use on new clothes after reading a silly little survey I did. In the survey, I'd said that after my last baby was born, I was in desperate need of clothes that fit, that weren't maternity clothes. Soooo long story short, she blessed me with such an amazing gift that I bawled my eyes out and was speechless for hours. We have a silly inside joke about believing in unicorns and she NEEDS that necklace. I would love to bless her with it. Sorry, I'm such a mini-blogger. Oh man I loved all her necklaces! so much in fact, that I've already bought one, cuz i didnt want to lose the chance to get it. but its not for me! its a gift. haha, i hope this doesnt hurt my chances of winning! but if i did win, I'd probably want the acorn necklace, or the unicorn! i would definitely buy the squirrel necklace. i live in a city and i love how cute and funny the squirrels are right now gathering nuts for the winter.... but when they come too close i secretly think they're a little scary!